Trying to find Santa Christmas stockings or something holiday themed? 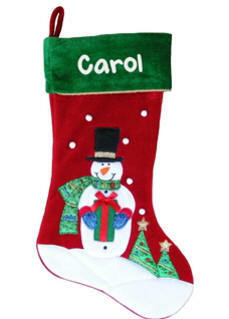 These personalized Christmas stockings for kids are great fun! Choose your holiday theme between Santa Christmas stockings, snowmen stockings or reindeer stockings. 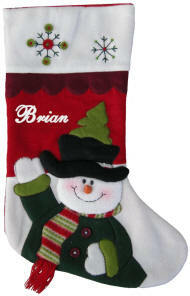 All holiday stockings may be personalized with a first name, usually embroidered on the stocking cuff. 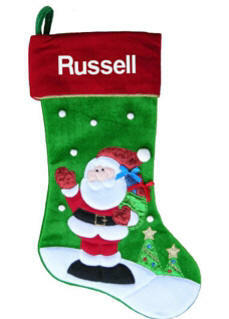 You may select your own choice of lettering style and embroidery thread color for your personalized Christmas stockings. You can let our embroiderer decide or choose the embroidery to be done as shown. 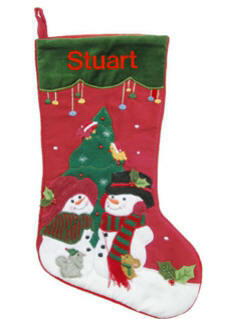 Our personalized Christmas stockings for kids are embroidered on commercial embroidery machines, by expert embroiderers. Tis' the season for themed holiday stockings. 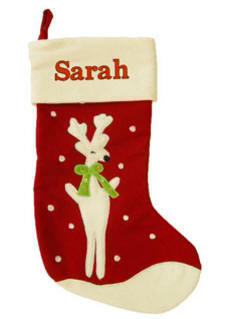 Your kids will not be able to stop smiling about their very own personalized Christmas stockings! This cute Christmas stocking has a wool snowman applique complete with black top hat, striped knit scarf, and buttons on his belly. We will embroider a first name on the cuff. 19 in. long. Simple reindeer design on this red wool Christmas stocking. Her neck is tied with a lime green bow, accented with sequins and beads. 19 in. stocking has a lined front. 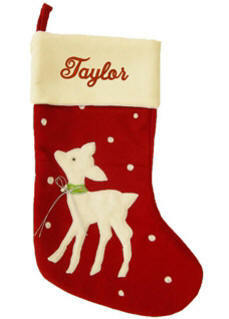 This baby reindeer Christmas stocking has a lined front and a fabric back. Reindeer's collar has two silver jingle bells attached. We will personalize this 19 in. Christmas stocking with a first name embroidered on the cuff. Delightful Christmas stocking with a curly bearded Santa. 18.5 in. stocking. We monogram in the center of the stocking, below the cuff. 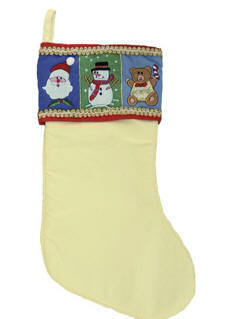 A delightfully appliqued and decorated stocking to grace your mantel this Christmas season. A snowman wearing a scarf and hat waves hello. This 18.5 in. long felt Christmas stocking is delightfully decorated. We personalize with an embroidered name. Two snowmen in festive hats are waiting for Santa. This 19 in. kid's Christmas stocking in red and dark green velvet, has a fabric back. Personalize with your child's name. Festive appliques decorate this kid's stocking. 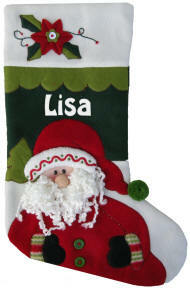 18.5 in velvet stocking appliqued with Santa carrying gifts. The red cuff is edged in metallic trim and can be personalized with an embroidered name. Appliques of felt and metallic fabric decorate this festive snowman with a black top hat. We will embroider a first name on the green fold down cuff. 18.5 in. long. 17 in. 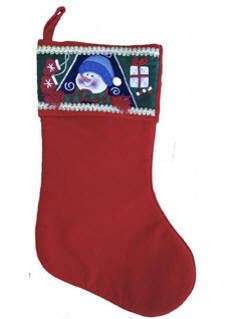 Christmas stocking has fiber optic lights - HO HO HO lights up with flashing red lights and snowflakes flash with white lights. Personalize with a name. Plaid top Christmas stocking has some beautiful appliques of a Santa on the roof top. 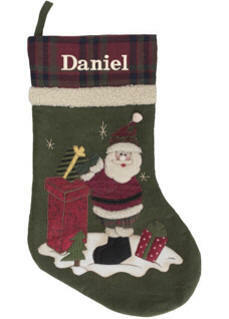 We can personalize on the top of this Christmas stocking with an embroidered name. Stocking has a lined front and dark olive back. 22in long. Fun plaid top Christmas stocking has some beautiful appliques of a snoman, wrapped gifts and a birdhouse topped with snow. 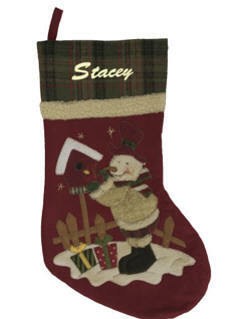 We can personalize on the top of this Christmas stocking with an embroidered name. Stocking has a lined front and burgundy back. 22in long. 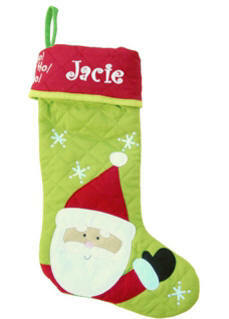 Santa is waving hello on this brightly colored Christmas stocking. He's coming to your house. Make sure he knows which stocking belongs to your child! We personalize on the cuff with an embroidered name. 19 in. long. This thick plush red velvetine stocking has an embroidered cuff. The cuff is embroidered and appliqud with a festive winter scene of a Christmas tree, jolly snowman and a house with a snow covered roof. 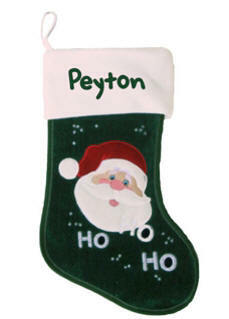 This very nice Christmas stocking can be monogrammed with a first name as shown. 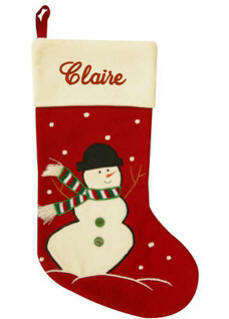 This plush white velvetine personalized Christmas stocking has a fold down embroidered cuff. The cuff is embroidered and appliqud with a festive winter scene of a Christmas tree, jolly snowman and a house with a snow covered roof. Personalize with an monogrammed first name if desired.